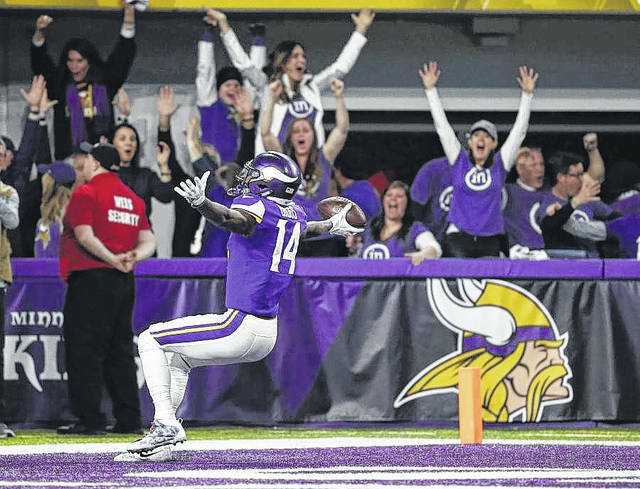 Minnesota Vikings wide receiver Stefon Riggs (14) celebrates in the end zone after a game winning touchdown against the New Orleans Saints in the final minute during the second half of an NFL divisional football playoff game in Minneapolis on Sunday. MINNEAPOLIS (AP) — There wasn’t much left for Case Keenum to do but to fling the ball deep and hope for a miracle. Keenum completed a last-ditch heave near the sideline Sunday on the game’s final play, and Stefon Diggs slithered away for a 61-yard touchdown to give Minnesota a 29-24 victory over New Orleans and send the Vikings to the NFC championship game, with one more win needed to become a first-time Super Bowl host. This wasn’t quite Franco Harris and the Immaculate Reception for Pittsburgh in the 1972 playoffs, but these Vikings are on some kind of special path. They finished 13-3 during the regular season, giving the career backup Keenum the keys to the offense after Sam Bradford went down with a knee injury after the opener. Brees connected with Michael Thomas for two of his three touchdown passes in a span of 3:09 of the second half. The first score came after a 12-play, 80-yard drive. The second was set up at the Minnesota 40 by an interception by Williams after an off-balance throw by Keenum, his one costly moment of either inexperience or recklessness. When George Johnson blocked Ryan Quigley’s punt, the Saints took over at the Vikings 40. Four plays later, rookie Alvin Kamara, whose breakout was a major factor in the team’s NFC South title and breakthrough from three straight 7-9 finishes, caught a 14-yard pass from Brees for a 21-20 lead with 3:01 left. Forbath’s 53-yard field goal, his third make of the evening against his former team, gave the Vikings their lead back with 1:29 left. That was more than enough time for Brees, the sure-bet Hall of Famer with a Super Bowl ring and all kinds of records. But after Brees got Lutz in position, there were just enough seconds remaining for Keenum — the undrafted and undersized all-time leading passer in NCAA history at Houston whose first career playoff start ended in spectacular fashion. He finished with 318 yards, going 25 for 40, with Diggs catching 137 yards on six catches. “This will take a while to get over,” said Payton, who fell to 1-5 on the road in playoff games. Brees saw his 13th career postseason game end in a crushing final moment, his 25-for-40 performance for 294 yards tainted a bit by two interceptions before halftime. One came on a leaping grab by safety Andrew Sendejo, the other off a tip by Everson Griffen that landed in Anthony Barr’s arms at the Minnesota 10-yard line midway through the third quarter. The Vikings came roaring out of their first-round bye, forcing punts by the Saints on their first three possessions and moving 55 yards in eight plays for a touchdown on their first drive. The shrewd play calling by offensive coordinator Pat Shurmur, culminating with a pitch to Jerick McKinnon for a 14-yard run after a fake jet-sweep, showed again why he was interviewed by four teams last week for head coaching vacancies. Aided by two pass interference calls on Ken Crawley for 54 yards, the Vikings reached the 1-yard line before settling for a short field goal. They pushed the lead to 17-0 early in the second quarter when Latavius Murray plowed in from the 1-yard line. The only other time the Saints went scoreless in the first half of a postseason game was five years ago. They fell behind 16-0 at Seattle in the divisional round and lost 23-15 to the eventual Super Bowl champions. https://www.limaohio.com/wp-content/uploads/sites/54/2018/01/web1_Diggs.jpgMinnesota Vikings wide receiver Stefon Riggs (14) celebrates in the end zone after a game winning touchdown against the New Orleans Saints in the final minute during the second half of an NFL divisional football playoff game in Minneapolis on Sunday.